One of the greatest things about blogging, and one of the most challenging things sometimes too, is trying to come up with new ideas. 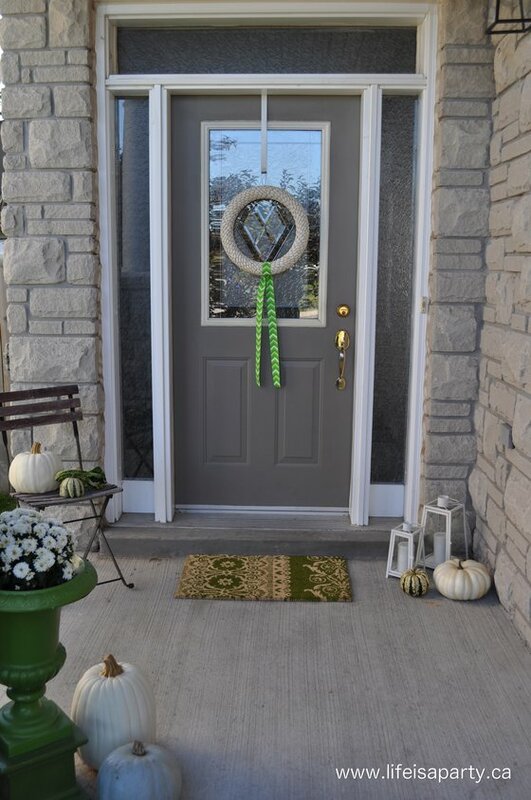 I really, really loved my front door fall wreath, leaf doormat, and white fall planter from last year. So when I decided to decorate my front door for fall this week, I kinda just wanted to do last year’s all over. 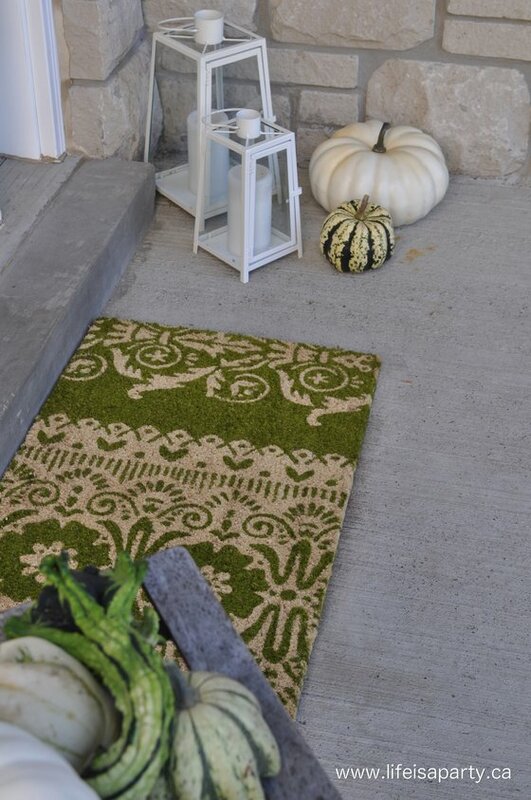 But now that I’ve come up with this lime green and white fall entrance way, I’m in love with it! I hope you like it too. 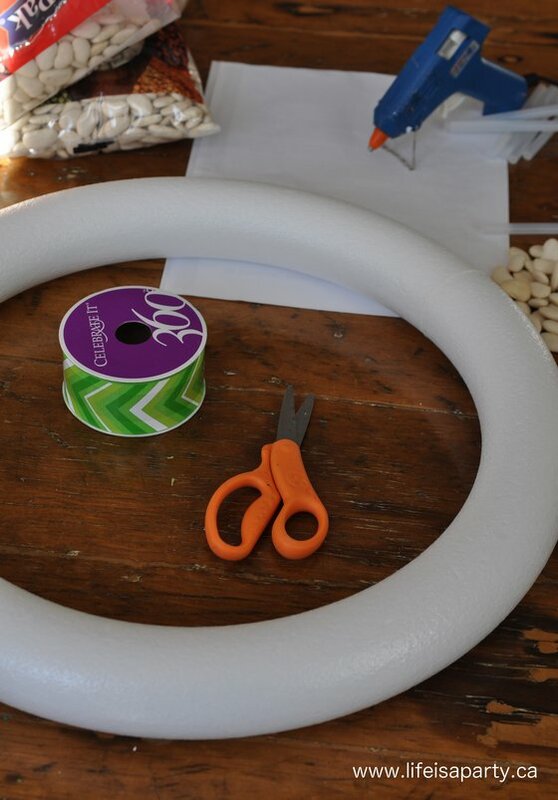 I loved the white last year, and white for fall seems to be a really strong trend this year too, so I started out with wanting to create a white, neutral fall wreath. I thought about different things I could use. Acorns came to mind, but I didn’t have any, then I thought about some kind of dried bean or lentil. 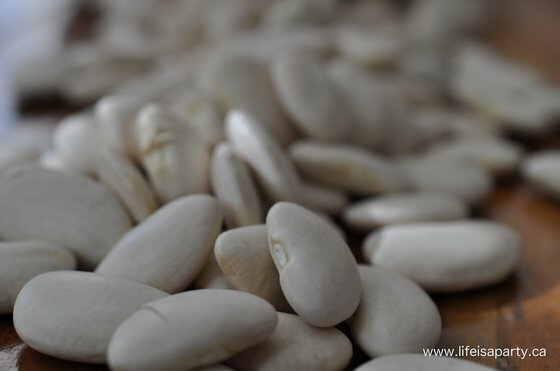 I ended up picking up a couple bags of lima beans. I really like their soft beige-y white colour and texture. I started out with a white styrofoam wreath, so that the gaps between the beans wouldn’t be noticeable. 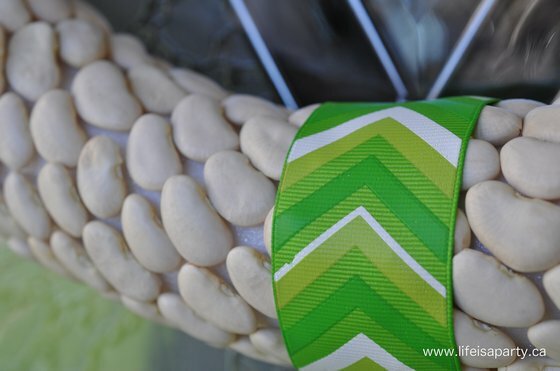 I glued them on with a glue gun, to make a lima bean wreath. I had already planted my bright green planter with a white mum weeks ago, when my summer urn started to fade -to put it mildly. This was the jumping off point for the lime green and white colour scheme. 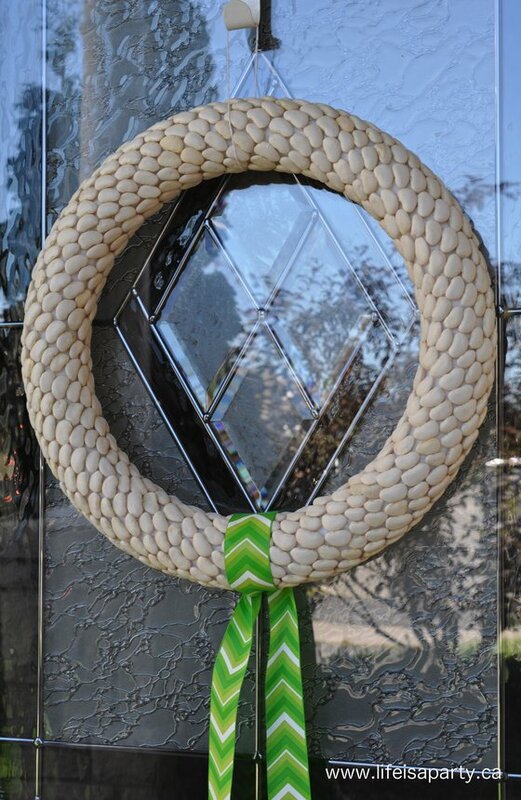 I picked up some pretty lime green chevron ribbon for the wreath. I found the perfect new door mat to go with the green scheme. 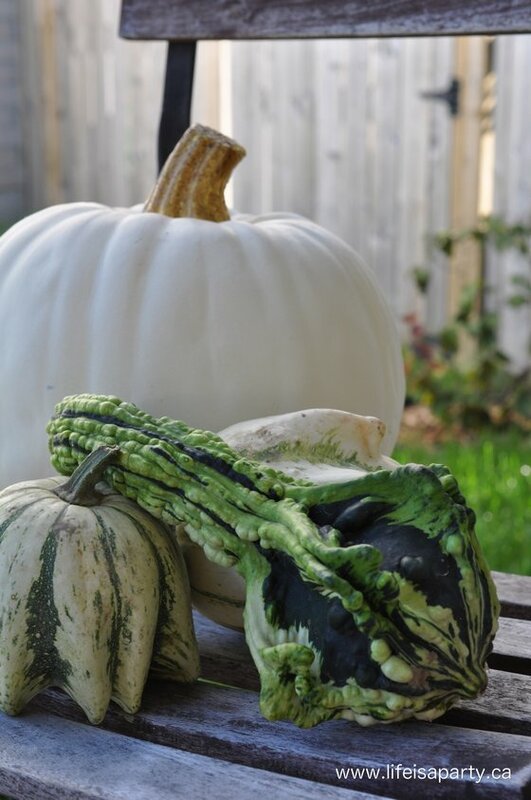 I picked up some great gourds in greens and whites at a farm stand, and mixed them in with a few faux white pumpkins from last year. They’re so pretty with all their different textures and shapes. Love how the lime green, dark green, and white all tie in. 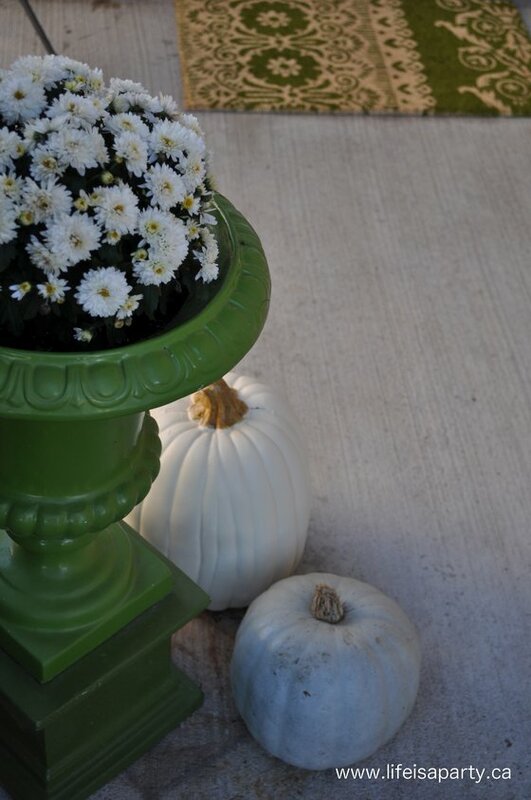 My favourite was this bluish, grey pumpkin -love how it looks next to the bright green urn. I included some white lanterns too. 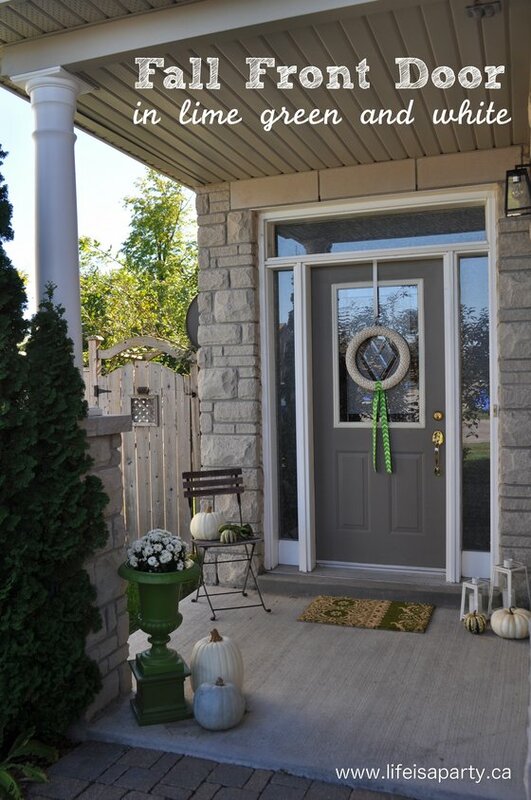 I really like how fresh, but still fall-ish the front door turned out. If you’re after something a little less orange this fall too, hopefully this will give you a little inspiration. 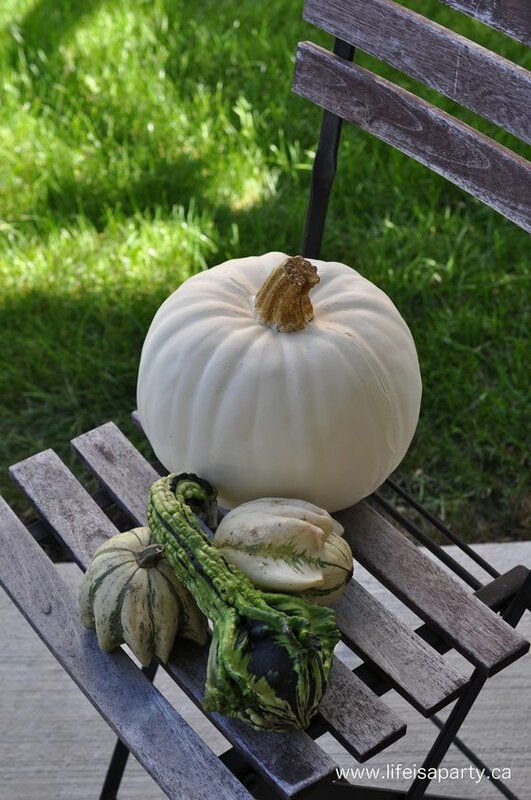 With decorating for fall this fresh and pretty, life really is a party! This post is linked up at The 36th Avenue, The Inspiration Gallery, Link Party Palooza at Tatertots and Jello, French Country Cottage, and Monday Funday Link Party. I love this color scheme! 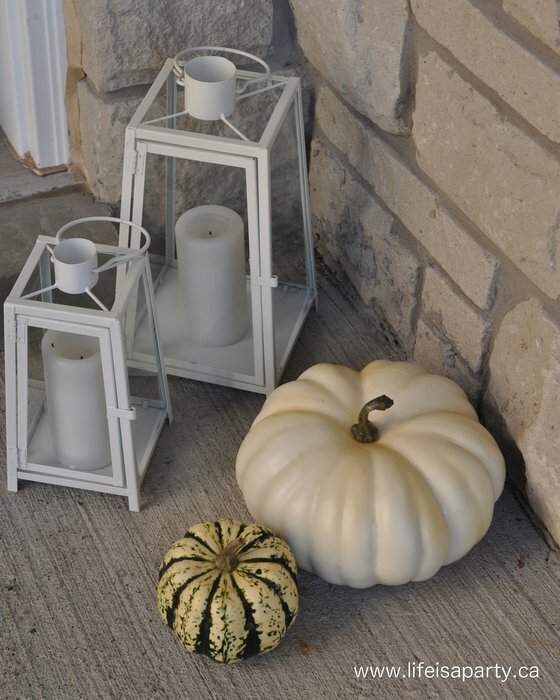 I’m so drawn to white pumpkins this year, too! From a distance, I would never have known those were lima beans on your wreath. This is such a lovely break from the traditional orange. I’m visiting from The 36th Avenue link party. Love your front porch! The colors are so calm and welcoming. Beautiful! Looks beautiful! I love your color scheme.